My drink of choice if I have my druthers is a Sazerac Cocktail. My friend Joe Ann would say it was a Sweet Old Fashion; but I am saving that one for another post. As a teenager I loved Vodka Gimlets. I know, I know teenagers aren’t allowed to drink; but when you are raised in New Orleans, it’s a different story. I don’t drink to excess and luckily I can count the number of times that I have. Well……Jay was my next door neighbor and certainly one of my best friends. He drove a Pontiac GTO in college and he often gave me a ride home from LSU on the weekend. We drove home down Hwy. 90 and as soon as he got on the highway, he would gun it and my head would snap back. I will never forget it. I bet he still loves fast cars. When I didn’t have a date on a Saturday night, he would take me out and to this day he won’t let me live down the night I drank five Vodka Gimlets and I will leave it to him to tell the rest of the story. No more Vodka Gimlets for me! My all time favorite drink for the last many many years is the Sazerac. For those who want to try something delicious, gather the ingredients and for your drinking pleasure, here is how it is made. 1/2 teaspoon absinthe, or Herbsaint or Pernod or Absente. 1 small dash, a scant drop, of Angostura bitters (extremely optional; some feel it helps open the flavors, but traditionalists may leave it out). The traditional method: Pack a 3-1/2 ounce Old Fashioned (rocks) glass with ice. In another Old Fashioned glass, moisten the sugar cube with just enough water to saturate it, then crush. Blend with the whiskey and bitters. Add a few cubes of ice and stir to chill. Discard the ice from the first glass and pour in the Herbsaint. Coat the inside of the entire glass, pouring out the excess. Strain the whiskey into the Herbsaint coated glass. Twist the lemon peel over the glass so that the lemon oil cascades into the drink, then rub the peel over the rim of the glass. My preferred method: Always use a nice big rocks or Old-Fashioned glass for this drink. When it becomes your favorite drink you can purchase tumblers with the word Sazarac on them from the Roosevelt Hotel in New Orleans where the drink was invented. I also recommend the use of prepared simple syrup (1-1/2 parts sugar to 1 part water) for this and most other cocktails involving sugar that don’t involve muddling. I don’t like adding granulated or lump sugar to a drink unless I’m muddling, because it never quite dissolves completely. In simple syrup the sugar is already dissolved, so there’s no chance of serving a gritty drink to your guests. As I find that the flavor of Herbsaint is far superior to that of Pernod (the usual Herbsaint substitute), it’s worth your while to seek it out. Actually, it’s worth your while to get a bottle of good absinthe, as it’s easy enough nowadays. Add the absinthe or Herbsaint to the glass, and then swirl it around to coat the entire sides and bottom of the glass. Discard the excess, although if you enjoy a bit more of the flavor of the absinthe or Herbsaint you may wish to leave a small amount of it in the bottom. Remember that the flavor of the absinthe should be there, but in the background — it should not dominate. In a cocktail shaker, add the sugar syrup, whiskey and bitters. Add ice and stir gently for about 30 seconds (and don’t shake it — you don’t want a frothy Sazerac) or until the drink is cold, then strain into the Herbsaint-coated glass. Twist lemon peel over the drink, and try to watch carefully to make sure a cascade of tiny lemon oil droplets actually strike the surface of the drink. 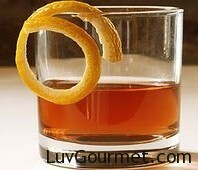 Rub the twist over the rim of the glass, then add as garnish. Enjoy! I have a new granddaughter. Her name is Maggie and two weeks ago she was named in the synagogue. She is the first child of my oldest son, Benjamin and his beautiful wife Beth. In the Jewish faith, if your ancestors were from Eastern Europe a child is usually named after a deceased member of your family. It is said, “that the soul is not at rest, until it is named.” My son and daughter- in -law so honored my Mother, by naming her Margaret and she will be called Maggie. Her middle name is Irene which was Beth’s grandmother’s name. 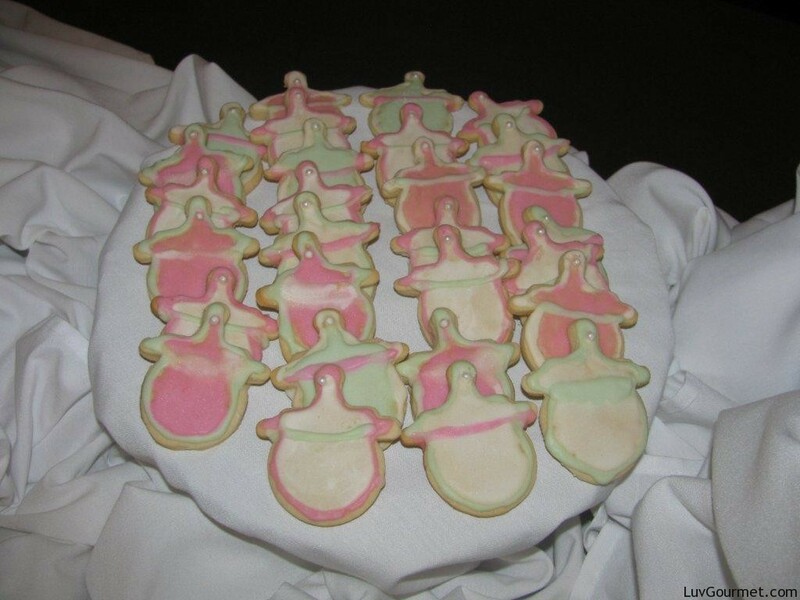 The day called for special refreshments and a beautiful dinner was served. I volunteered to provide dessert. 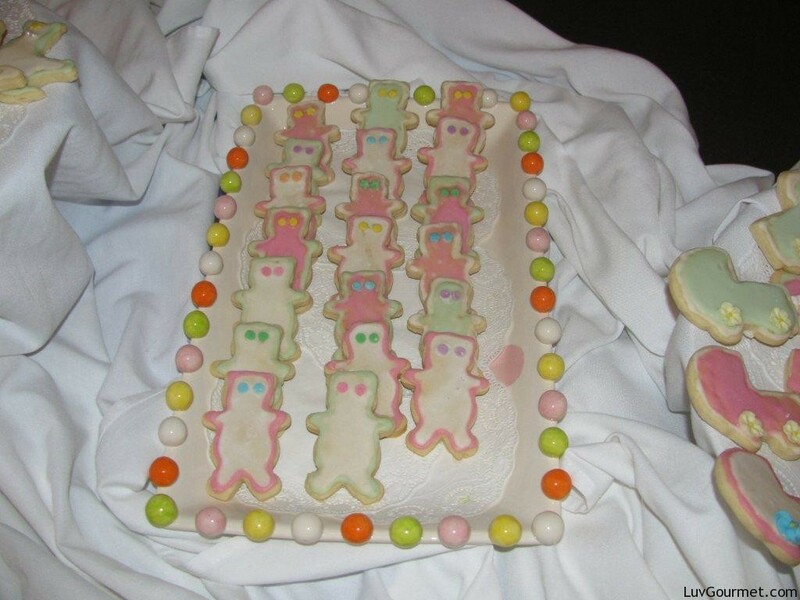 I wanted to make these special cookies that I had seen many times in better bakeries; but because they looked so hard to make, I was truly intimidated. 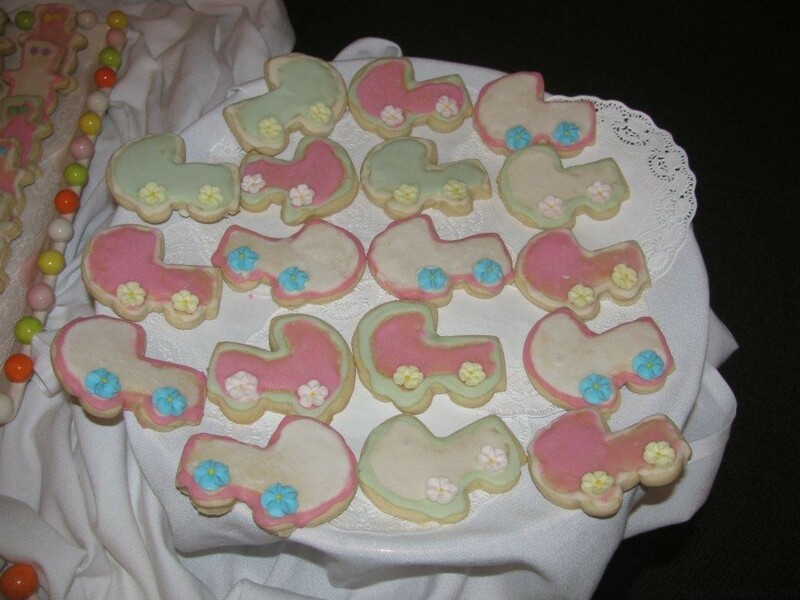 Two friends said they would help me and we began the task that I labeled a “labor of love.” Lynn, the event designer and owner of Zinnsations, one of the best event design houses in Atlanta created a fabulous centerpiece for my cookies and we were off to the races. 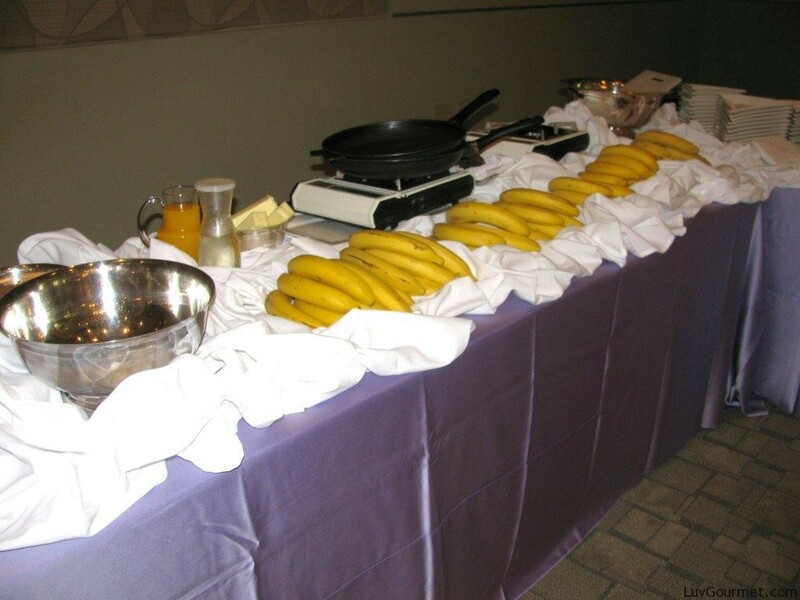 I added a Bananas Foster table and everyone was happy. Tonight is pizza night. Any time we want a simple meal that doesn’t cost an arm and a leg we make pizza. 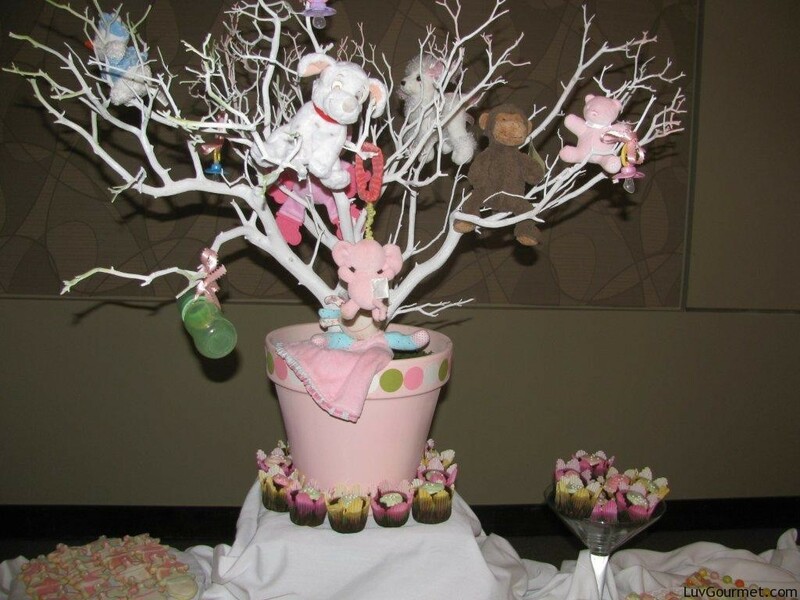 Every member of the family has their favorite and because we are all cooks we get to show off our creative side. Benjamin makes a killer barbecued chicken pizza. Blaiss puts shrimp on his and Lilly is a pepperoni kinda girl. Rose likes a white cheese pizza and I like the one pictured, which is so delicious. Steve just likes cheese. Roll out the dough and semi bake. 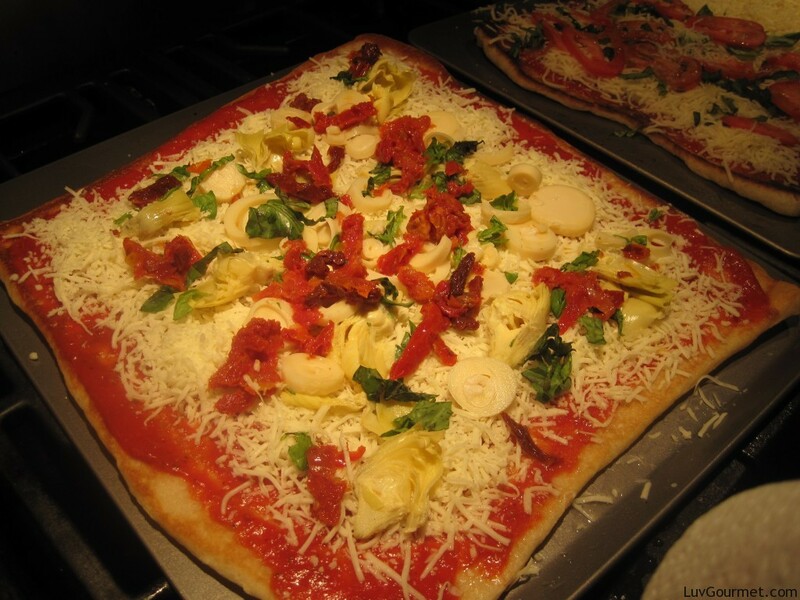 Spread pizza sauce and layer with shredded mozzarella cheese, fresh or canned hearts of palm, artichoke hearts, roasted red peppers and fresh basil. Bake at 450 degrees until done. The dough is very important. The brand, Martha White markets a package for pizza dough that you only add water to and then roll it out. It is very easy and can be found at most supermarkets. Another “just add water “pizza dough is made by Chef Boyardee. Additionally, most grocery refrigerated cases carry a pizza crust made by Pillsbury and yet a fourth choice is to purchase fresh dough already prepared by your local bakery or pizzeria. If your city has a Publix Supermarket, get fresh dough at their bakery. My brother –in- law, Morris used to own a really unique coffee shop. The shop was known for excellent coffee and teas and the breakfast and lunch menus were different and delicious. He had adapted many of the foods his Mother and grandmother had made in his youth and every time I was in, he would serve me one of his new creations. This recipe is truly one of my favorites. It is comforting and delicious. Beat eggs and mix in all ingredients. Let the mixture soak together pushing bread into liquid with the back of a large spoon. Grease a casserole dish and pour in mixture. Bake at 350 degrees for 45 minutes or until mixture is dry. Pack pudding tightly to avoid splitting during baking. Mix the brown sugar with corn starch and add the cream in a heavy saucepan. Add the butter and stir continuously on a low fire until it thickens. Take off the heat and add the vanilla and stir for a final two minutes. 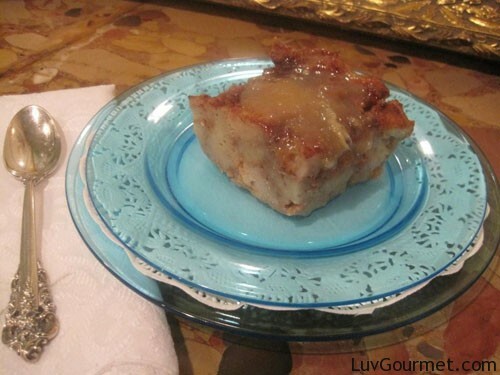 I am also in love with mushroom bread pudding which I serve as a light meal with a salad for luncheon or dinner. Whisk the eggs until well beaten and add ½ C of parmesan and the other ingredients. Cube bread and pour into liquid mixture, Mix and press bread into liquid with the back of a spoon. Set aside. Preheat the oven to 350 degrees. Grease a baking dish lightly. Heat the olive oil at medium using a large heavy pot or skillet and add mushrooms, garlic and all fresh and dry seasonings. Cook mixture until mushrooms are semi soft and brown. Remove from heat and season mushrooms with salt and pepper to your taste. It has been over thirty years since my mother-in-law taught me how to make these wonderful savory pastries. Although labor intensive, when you gather family or friends for a morning of coffee and schmoozing, the process goes very quickly and the effort produces a delicious end product. A delicate pastry, this recipe calls for a savory filling and are called by a myriad of different names. 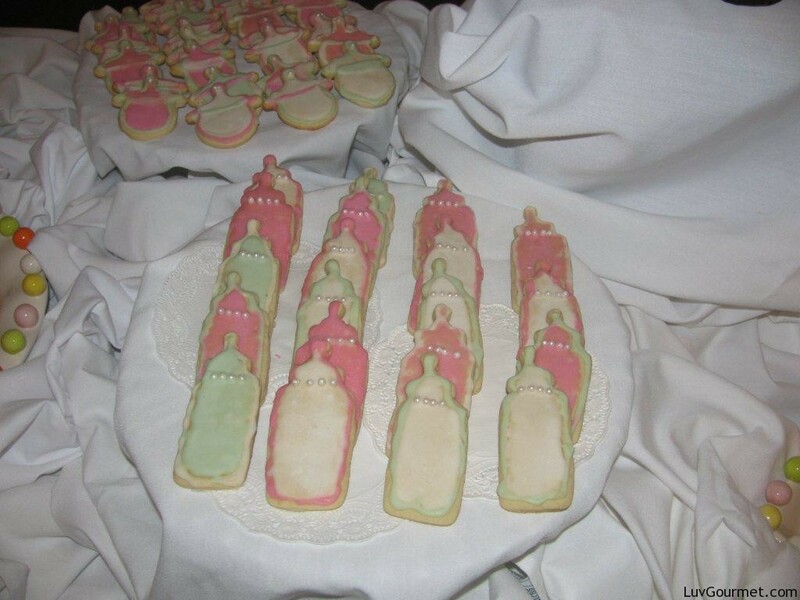 The name usually depends on what country the pastry originated and what filling is used with it. Whether you serve an herb filled palmier, a meat filled empanada, a spinach or eggplant bureka or this sambusak recipe filled with cheese or meat, these appetizers are perfect for your freezer, family or next party. To make the pastry, first combine the flour and salt. 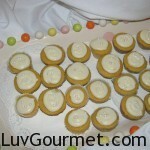 Using an electric mixer, cream the butter or margarine and gradually blend in the flour. Add the water and oil. Knead until a ball forms. Only use the water if needed to form the dough ball properly. Let the dough rest as you prepare one of the fillings. Sauté the onion in oil until it is soft and translucent. Add the meat to brown, breaking it up with a wooden spoon. Let meat cool and add the spices and pine nuts. Prepare an egg wash, beating two eggs together with a tablespoon of milk. Spread 1 ½ C Sesame seeds on a flat surface or plate. Break off walnut size pieces of dough. Shape each into a ball and roll and flatten into a 3-inch round using the palm of your hand and the thumb of your other hand. Place a teaspoon of filling in the center of the round. Fold it over to make a half-moon and crimp the edges together tightly so that filling will not burst through. 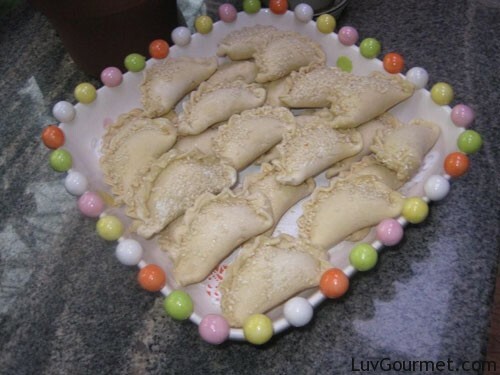 Brush each pastry with egg wash and sprinkle sesame seeds on the top of each. Sambusak can be frozen at this point. Place them in a single layer on a tray lined with wax paper to freeze. Remove them from the freezer and store them in double freezer bags and return to freezer. To bake frozen pastries, place them on ungreased baking sheets and bake for 20 minutes in a 400 degree oven or until golden. 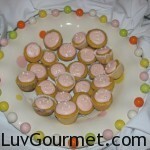 If they are not frozen, bake for 15 to 20 minutes or until golden. As a young adult, I couldn’t wait until the meal was over to have this delicious dessert at a restaurant that went out of business long ago. It doesn’t look like a traditional tort, but its name is indelibly blazoned in my brain as an “almond tort” I have renamed it Almond Heaven. 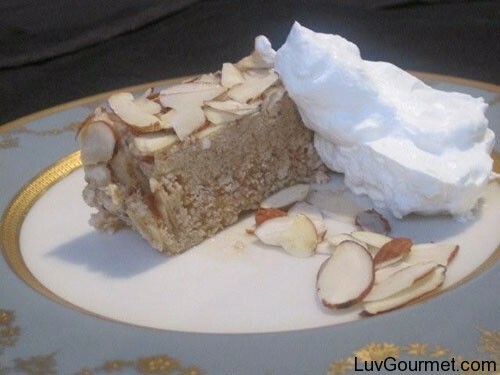 When I married and started cooking in my own home, I experimented with different sugars and came up with this no bake dessert, which is very close to the original. It takes few ingredients, is extremely easy to make and after freezing, just slice and serve with a generous topping of sweetened whipped cream. 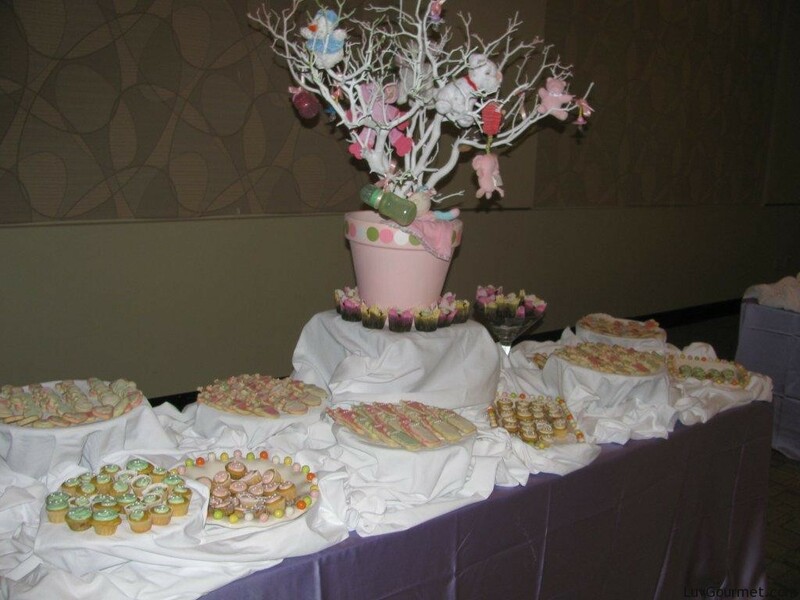 It is extremely rich do a half inch disc is all that is needed to satisfy everyone’s sweet tooth. It can stay fresh in the freezer for two months. Beat butter until light and fluffy and gradually add in sugar, beating well after each addition. Add egg, beating for one minute. Add almond extract and partially ground 1 cup almond. Mix well. Shape into a log approximately 8 inches long and two inches wide. Roll log in ¾ C sliced almonds. 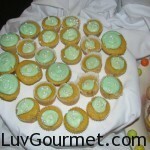 Carefully wrap in aluminum foil and freeze. To serve, let stand at room temperature for ten minutes and cut into one-half inch slices. Put a dollop of whipped cream over each disc. It seems a lot of my taste in food comes from my New Orleans upbringing. My family didn’t move to Atlanta until I was in my forties, so my Southern ways are strictly New Orleans sophisticated. I don’t mean to sound snobbish; but the quality of the food I was raised with was first rate and its recipes, way above a casserole made with mushroom soup. 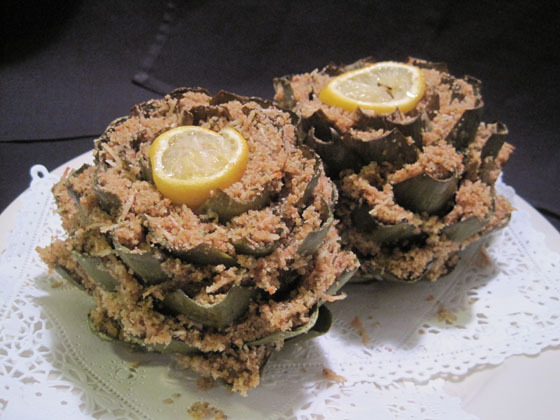 After moving to Atlanta, the quandary was where to get my stuffed artichoke fix. In the past, I had only to run over to Dorignac’s, the best grocery in New Orleans to buy this delicious Italian delicacy. And still after moving away, on car trips back home to Atlanta we would make three special stops before leaving the city. One was to the Central Grocery to buy a couple of Muffaletta sandwiches (more on that at a later time) and another to McKenzies, the local bakery chain, to bring back two dozen turtles…a most delicious shortbread cookie with a huge mound of Dennery’s brand chocolate on top. Of course the final stop was to Dorignac’s to pick up a stuffed artichoke. Needless to say the long ride home was delicious as we pigged out picnic style in our laps. Over the years McKenzie’s is out of business, a New Orleans type café in Atlanta now imports Central Grocery’s Muffalettas and I have been forced to learn how to make stuffed artichokes. 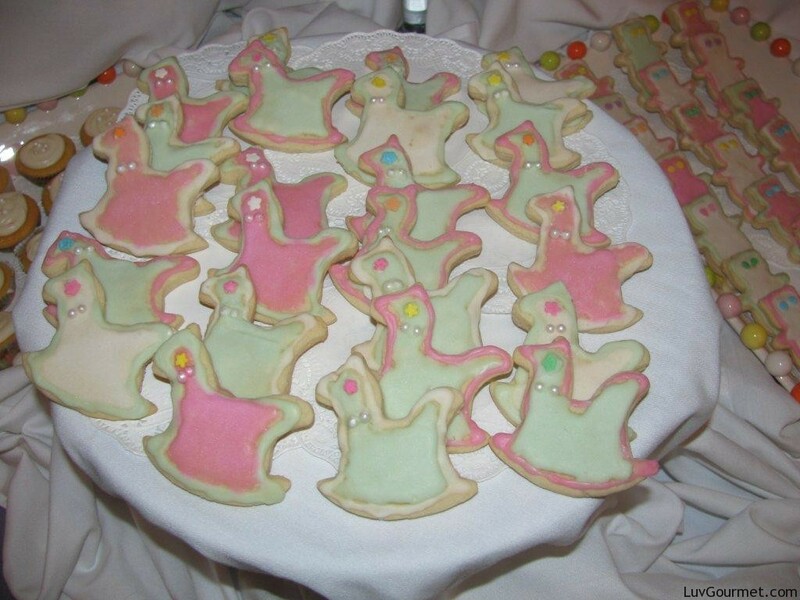 So it took a few years, but I taught myself how to make this delicacy and mine are almost as good as Dorignac’s…at least my children say they are. So my first dilemma was what method to use when cooking the artichoke. Many cooks follow the stuff the artichoke and then steam it in a few inches of water until the leaves come out easily. Using this method the chef has to continually monitor the dish and keep pulling a leaf to see if it is ready. The following recipe calls for parboiling the artichoke and then stuffing it. After stuffing, all that remains is to warm it in the oven till hot and serve. Soak artichokes in salted water to remove any bugs and rinse thoroughly. Cut stems off artichokes, flush with bottom. Cut pointy leaves off the top of the artichokes. Par boil artichokes for 15-20 minutes, or until they just begin to soften slightly or until leaf releases easily. Allow to cool. You pull the leaves from the artichoke one at a time. Draw each through your teeth slowly scraping and eating the stuffing and only the tender flesh at the base of the leaf. Continue until you reach what is called the heart of the artichoke and pull the spinney looking leaves off and eat what is remaining. It is excellent with a little vinaigrette or is very good just by itself. Growing up in New Orleans, seafood was a staple in our household. The city is surrounded by water as everyone knows after Katrina, so fresh seafood is always abundant. Not only are there fresh seafood stores all over the city; but trucks filled with shrimp and crawfish (New Orleans spelling) dot many corners of the city. Just pull your car over to the curb and buy whatever you need. It was disappointing, moving to landlocked Atlanta, where the grocery store gets their fresh frozen shipment on a Thursday and on Tuesday you must ask the clerk to let you smell the fish before you purchase it. Check out an article I wrote on buying fish from the grocery or finding a fish distributor in your city where the better restaurants get their seafood. The following recipe for Marinated Shrimp is a favorite and has been the starter appetizer for many gatherings in my home. Boil 2 lbs. shrimp in crab boil. (Liquid or powder) As shrimp turn pink, continually taste for doneness. Shrimp should boil for two to four minutes. Peel and marinate for a minimum of 24 hours. Turn shrimp in marinade for the first few hours. 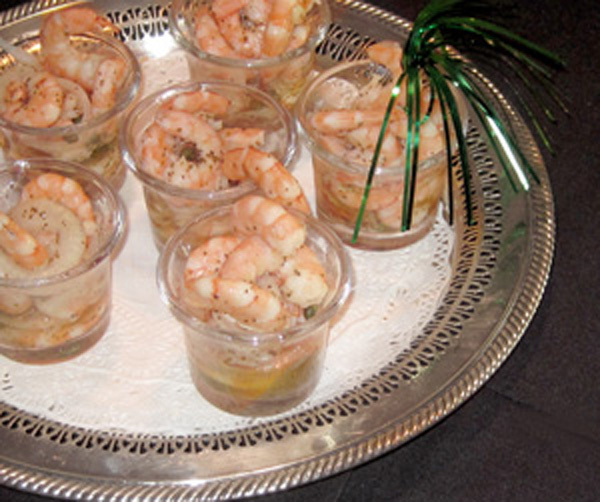 To serve individual portions, pass the shrimp around in shot glasses. Include a decorative toothpick as the utensil. The shrimp will be visually enticing as well as tasty! After a 10 mile bike ride I got home to a Benjamin/burger that had been fired up on the grill. 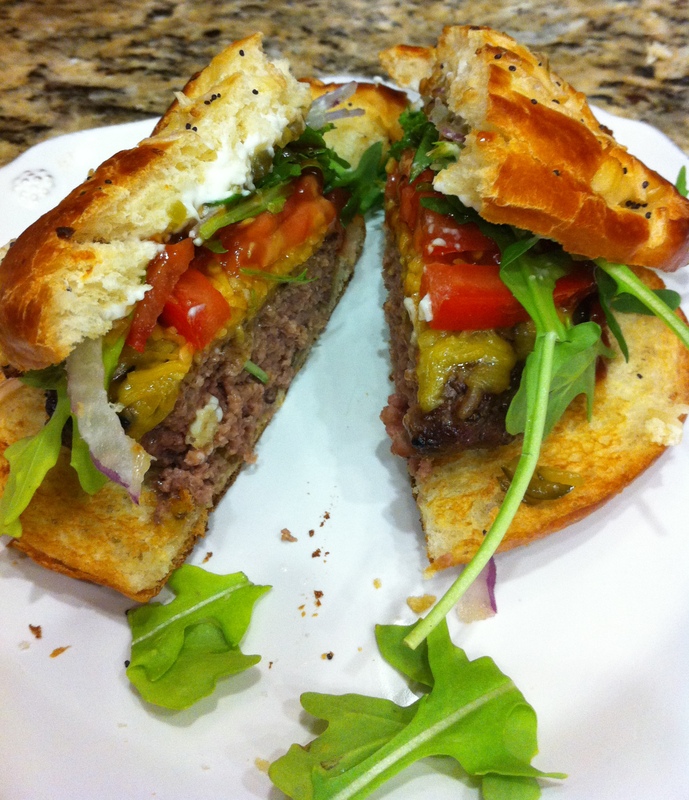 Ground beef, cheddar cheese, thinly sliced red onion, tomatoes, arugula, sweet relish with a light amount of light mayo and bbq sauce. Yummy! Season beef with seasoned salt,ground black pepper and granulated garlic. Cook burger on grill about 5 minutes on each side. Assemble burger with condiments.